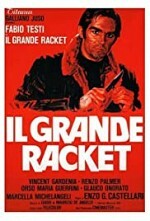 Watch The Big Racket: Nico Palmieri is a police inspector who battles a criminal gang terrorising a sleepy Italian town, extorting cash from the local merchants. With the threat of violence, no one dares to act, except for a restaurant owner who is forced by Palmieri to tell the truth. As a result, the owner's young daughter is raped, and the violence continues. Discovering that the gang is associated with drug dealers, Palmieri is forbidden to continue investigating his case by his superior - so he takes matters into his own hands. Palmieri recruits a couple of men who have become victims of the gang and sets out for a bloody revenge.